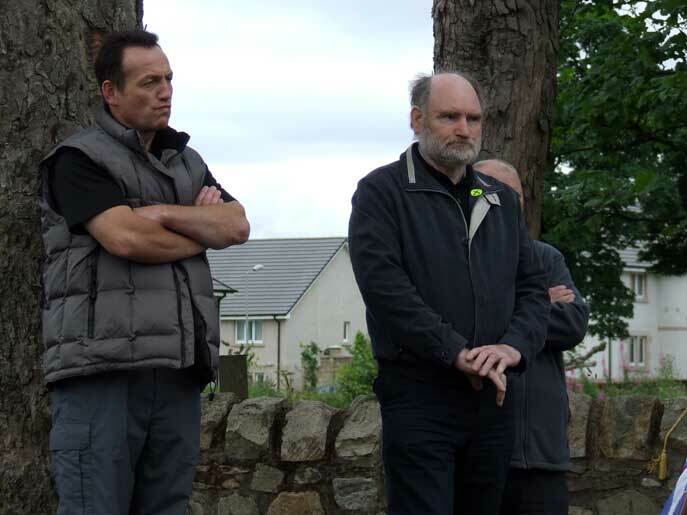 This year’s commemoration was held on a windy dull Saturday the 1st of August 2009, the nearest Saturday to the 5th. 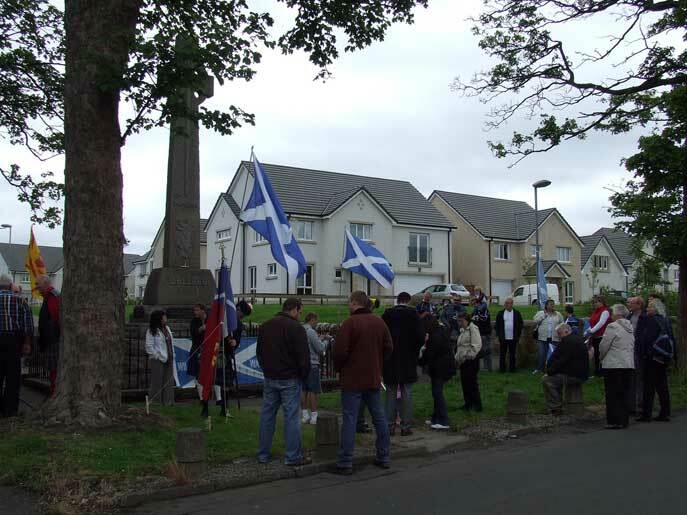 A very healthy crowd gathered around the Robroyston Monument to reflect once again on the tragic loss of one of Scotland’s favourite sons. 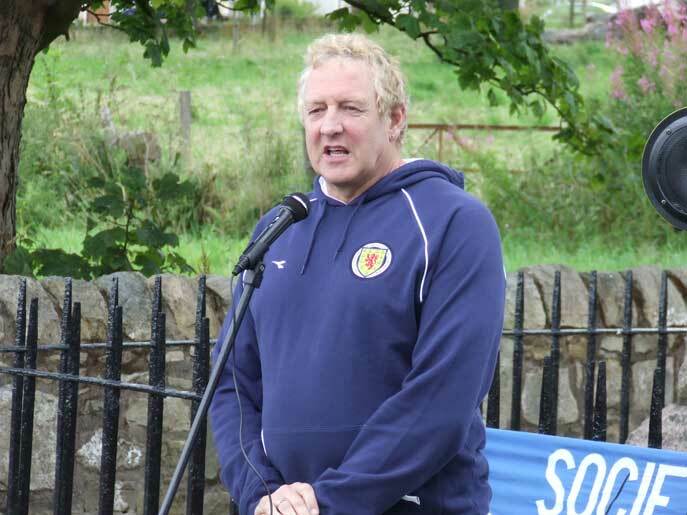 Vice Convener of the Wallace Society Duncan Fenton led this years commemoration with a great speech, I've rarely heard Duncan in better form and the applause at the end said it all, Duncan spoke for us all this day!! 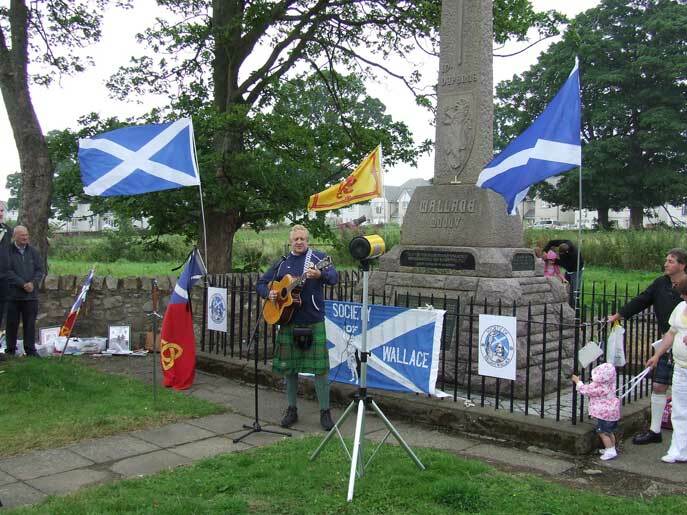 We had a special guest with us this year, young Glen Wood who was so sickened by the state of the monument and the well here at Robroyston that he mounted his own personal protest. 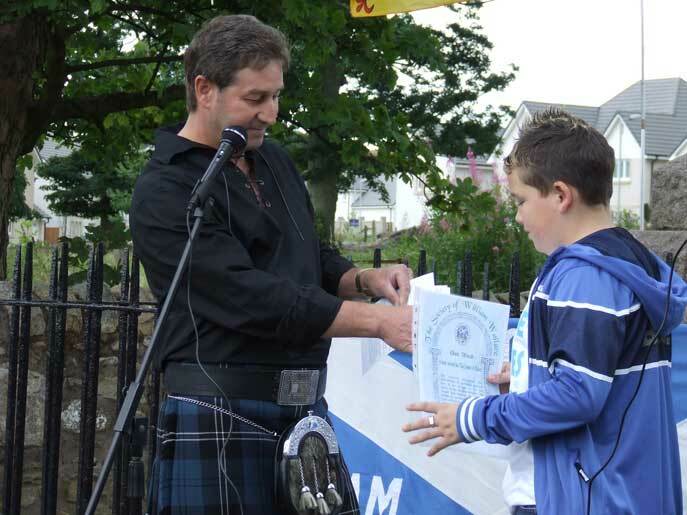 Duncan presented Glen with an honary membership of The Society Of William Wallace, well done Glen you deserve it. Duncan introduced the next speaker who was David R. Ross, Convenor of the Society, David always seems to know how to tap into the mood of the occasion and never fails to deliver some great stories of Wallace's life, this year was to be slightly different as David decided to sing us all a song and what achoice of song, I'm Coming Home was soon ringing out all around the monument and I'm sure Ted Christopher would have been very proud. Next to speak was my good self, and as luck would have it the weathere showed signs of becoming quite miserable but it held and my speech wasn't a long one and I'd like to thank everyone for their kind words afterwards. 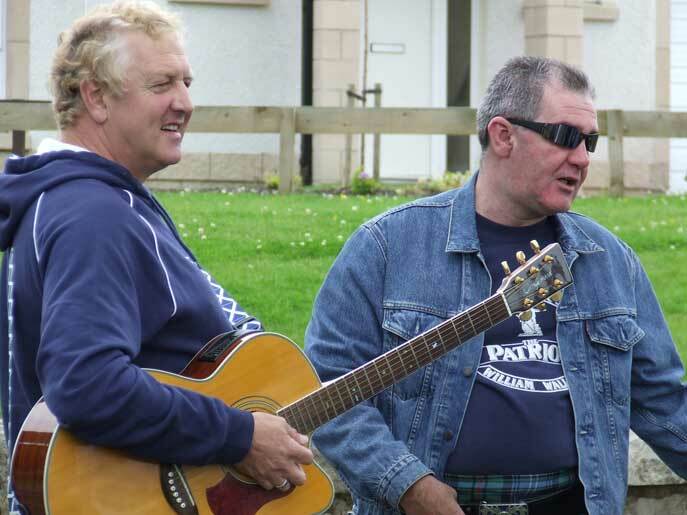 Duncan wrapped things up and once again brought David out to lead us all in a rendition of Scots Wha Hae which finished the proceedings nicely, we then retired to a local hostelry for some lunch and reflect on the day. 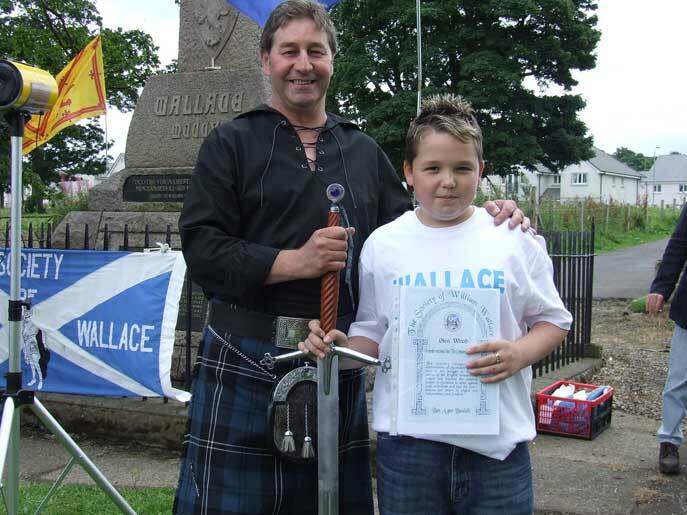 William Wallace will forever live on in our hearts and minds. David gives us the benefit of his knowledge on Wallace, superb stuff!! The monument all dressed up!! A fine rendition of "I'm coming home"
My chance to say how I feel about Wallace!! The lads standing on the weeds that have grown all over the monument!! 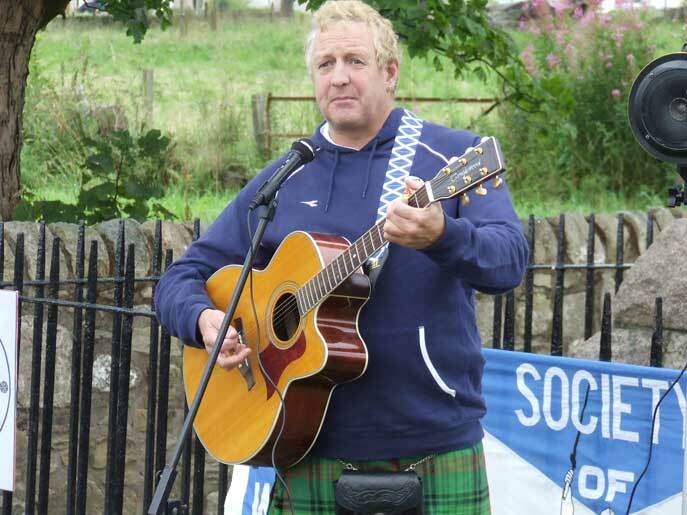 David leads us off with "Scots Wha Hae"
A day that hopefully Glen will remember for a very long time, well done Glen!! For anyone who wasn't there and by some remote possibility might like to have heard my speech, here it is!! 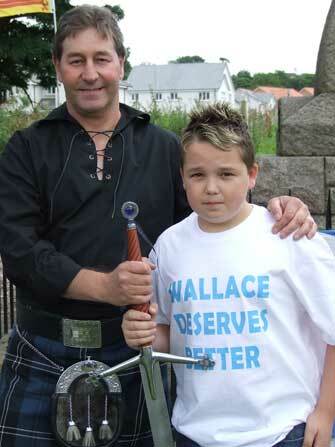 William Wallace is a name that is instantly recognised the world over; he is without doubt Scotland’s favourite son. 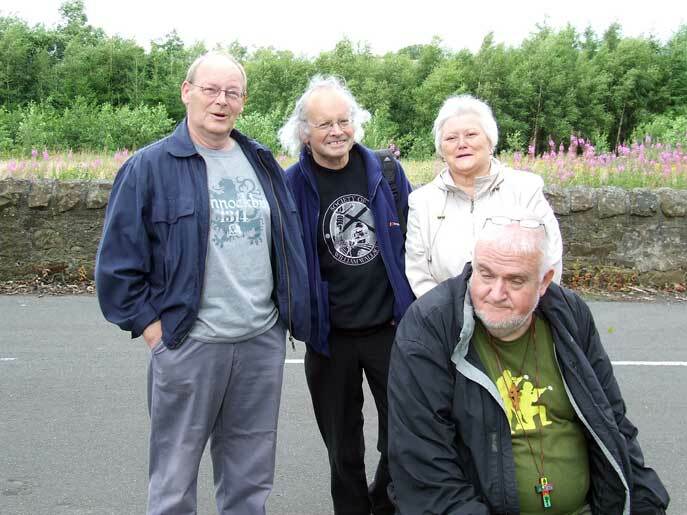 There are of course other great Scottish heroes and some who met with far greater success than Wallace. So why then is William Wallace our single greatest hero? What makes this man our greatest icon? It can’t be because of the movie “Braveheart”! It’s a wonderful film, a film that captures the spirit and strength of Scotland and her people, but the film was made because the icon existed, not to create it! "Braveheart" was made because the story of Wallace inspired Randall Wallace, Mel Gibson and others. Wallace was and remains one of the most inspirational figures of all time! In an age when position and privilege were more highly valued than talent and intellect Wallace fought for freedom and inspired the people of Scotland to fight with him. So effective was he that, despite his lack of rank in an age when rank was all, he was dubbed Sir William Wallace and appointed, in the absence of a rightful king, the Guardian of Scotland. 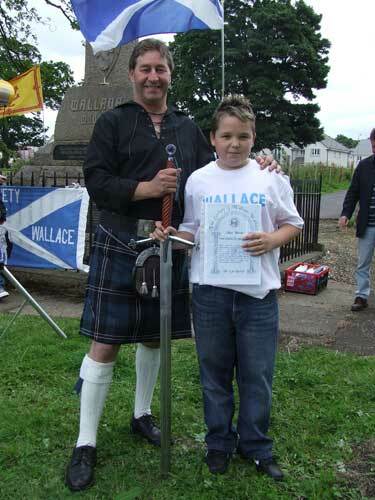 There we have the key to why William Wallace is revered. The Scots who fought with Wallace did not fight and die because it was their feudal duty to do so, or because they owed him a favour. They didn’t fight because they were on a promise of riches or lands. They fought for Scotland because Wallace inspired them to do so. 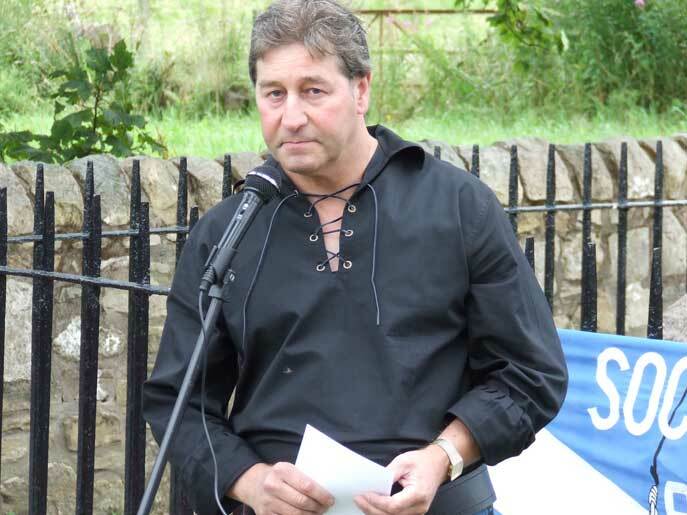 Sir William Wallace inspired an entire generation of Scots, not least the young Earl of Carrick who would eventually win the battle for freedom at Bannock Burn, as King of Scots. That generation of Scots, inspired by Wallace, would write the Declaration of Arbroath after his death. 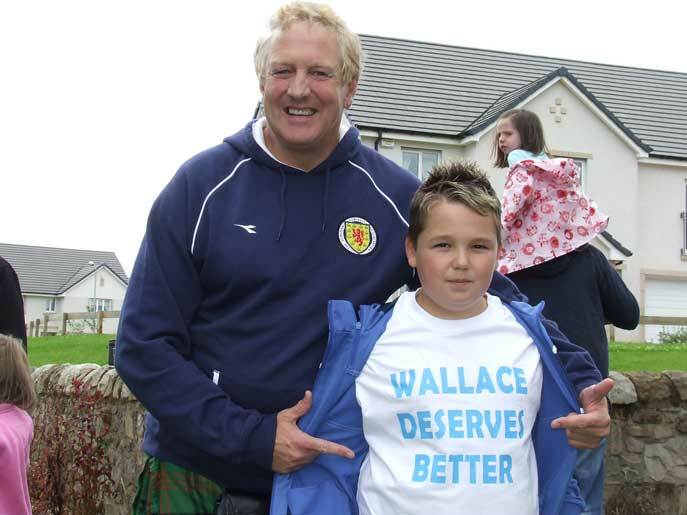 William Wallace didn’t write that phrase. But he was the inspiration for the men who did! He lived for that principle and sadly, he died for it! 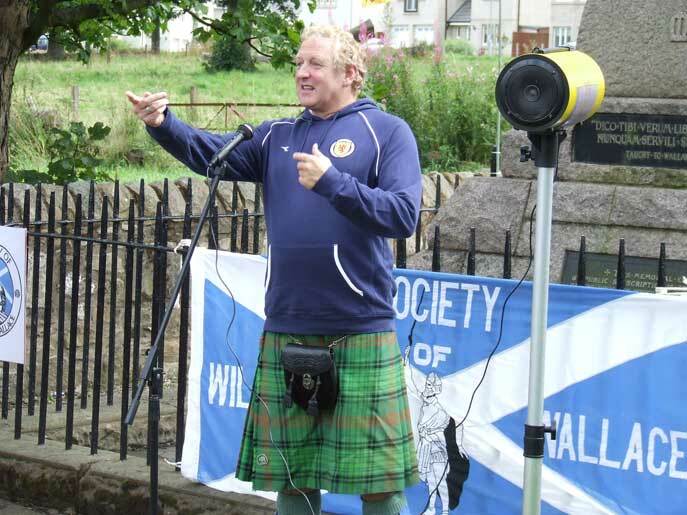 William Wallace gave the Scots their dignity and their self-respect and he gave the nation its very soul. In years to follow, the Declaration of Arbroath, inspired by Wallace, would in turn inspire the founding fathers of the United States of America as they wrote their Declaration of Independence. 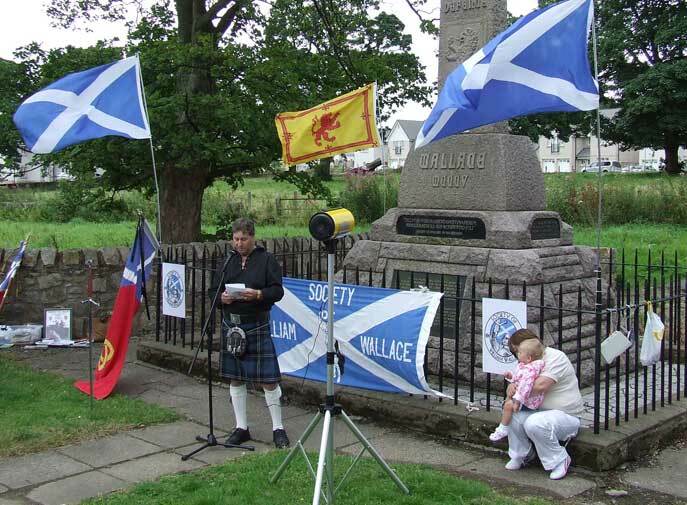 Wallace’s legend also inspired 100,000 people to gather on June 24, 1861, 556 years after his death, at the opening ceremony of the 300-foot National Monument in Stirling. 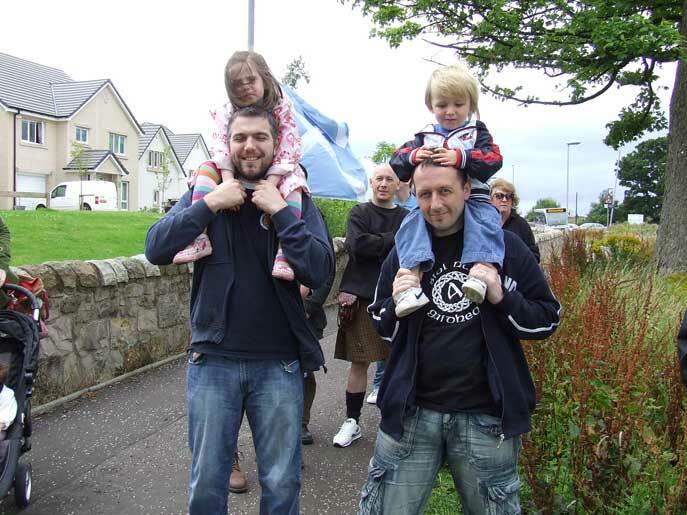 Fast forward to 2009 and he inspires young lads like Glen Wood to make his own personal protest here at Robroyston. 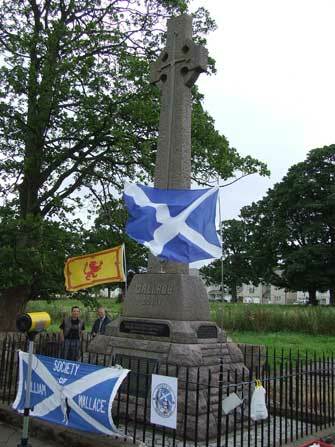 “Here stood the house of William Wallace who in 1297 first drew sword to free his native land”. This statement, although true enough, is woefully inadequate and does nothing to convey the enormous impact of the chain of events started by Wallace in Lanark, in May 1297. Wallace had drawn his sword on many occasions prior to these events. Indeed, picking fights with English soldiers wherever and whenever he found them could well have been considered the young Wallace’s hobby! 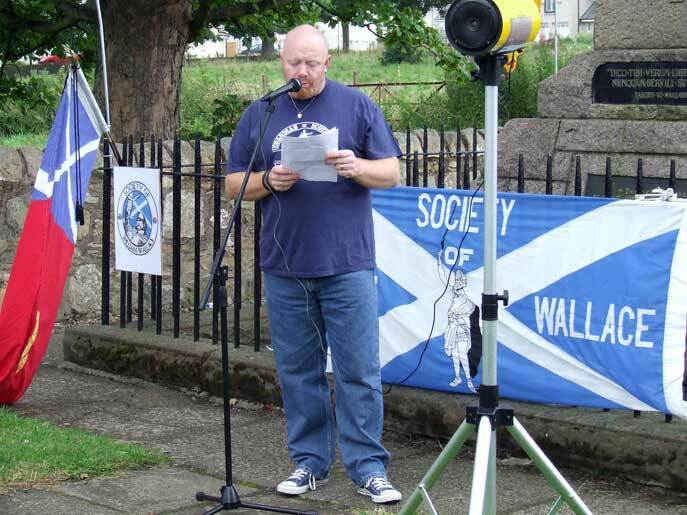 But after the brutal murder of his wife Marion, William Wallace, in his grief-stricken rage, embarked on a journey destined to light a burning ambition in the hearts and minds of the Scottish people to be free from the yoke of oppression. After Marion’s death at the hands of the English, setting Scotland free gave purpose to his life! More than that, Wallace inspired the people of Scotland, nobles and commoners alike, with the hope and the belief that they could succeed! King Edward Longshanks, the hammer of the Scots thought by destroying Wallace he would destroy Scotland. One day I would like to visit his tomb in London and do just as Davy Ross has told me what he does every time he’s in London. He visits Eddies tomb bends down by his ear and softly whispers, still here Eddie, still here! !